EVERETT, Wash. -- As deaths from painkillers and heroin abuse spiked and street crimes increased, the mayor of Everett took major steps to tackle the opioid epidemic devastating this working-class city north of Seattle. Mayor Ray Stephanson stepped up patrols, hired social workers to ride with officers and pushed for more permanent housing for chronically homeless people. The city says it has spent millions combating OxyContin and heroin abuse -- and expects the tab to rise. So Everett is suing Purdue Pharma, maker of the opioid pain medication OxyContin, in an unusual case that alleges the drugmaker knowingly allowed pills to be funneled into the black market and the city of about 108,000. Everett alleges the drugmaker did nothing to stop it and must pay for damages caused to the community. Everett’s lawsuit, now in federal court in Seattle, accuses Purdue Pharma of gross negligence and nuisance. The city seeks to hold the company accountable, the lawsuit alleges, for “supplying OxyContin to obviously suspicious pharmacies and physicians and enabling the illegal diversion of OxyContin into the black market” and into Everett, despite a company program to track suspicious flows. 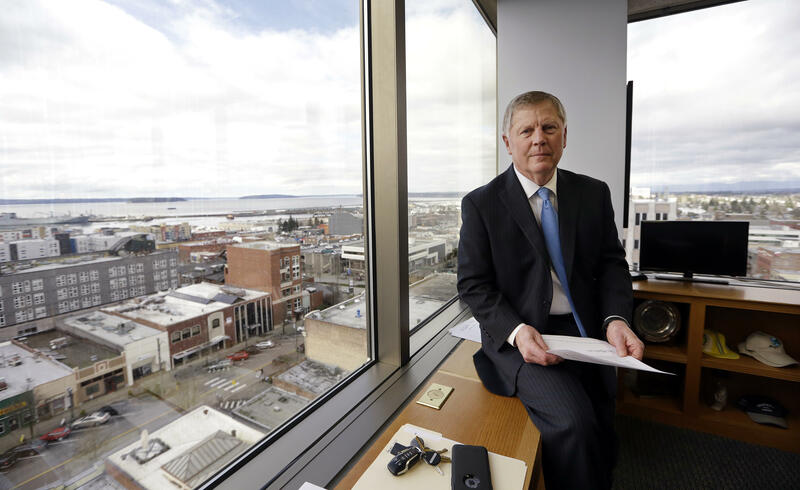 “Our community has been significantly damaged, and we need to be made whole,” said Stephanson, who grew up in Everett and is its longest-serving mayor, holding the job since 2003. “Purdue Pharmaceuticals was knowingly putting OxyContin into the black market in our community,” Stephanson told CBS Seattle affiliate KIRO-TV earlier this year. He said the opioid crisis caused by “Purdue’s drive for profit” has overwhelmed the city’s resources, stretching everyone from first responders to park crews who clean up discarded syringes. The lawsuit doesn’t say how much money the city is seeking, but the mayor says Everett will attempt to quantify its costs in coming months. Connecticut-based Purdue Pharma says the lawsuit paints a flawed and inaccurate picture of the events that led to the crisis in Everett. “We look forward to presenting the facts in court,” the company said in a statement. Purdue said it is “deeply troubled by the abuse and misuse of our medication,” and noted it leads the industry in developing medicines with properties that deter abuse, even though its products account for less than 2 percent of all U.S. opioid prescriptions. In 2007, Purdue Pharma and its executives paid more than $630 million in legal penalties to the federal government for willfully misrepresenting the drug’s addiction risks. The same year, it also settled with Washington and other states that claimed the company aggressively marketed OxyContin to doctors while downplaying the addiction risk. As part of that settlement, it agreed to continue internal controls to identify potential diversion or abuse. While numerous individuals and states have sued Purdue, this case is different because Everett is getting at the results of addiction, said Elizabeth Porter, associate law professor at the University of Washington. She thinks Everett may have a shot at winning, though it will have to overcome some legal burdens, including showing that diverted OxyContin from rogue doctors and pharmacies was a substantial factor in the city’s epidemic. Everett officials have been building a case since last summer, when a Los Angeles Times report detailed the flow of OxyContin from California to the Washington city, according to KIRO-TV. Stephanson said he was “absolutely outraged” after the report, which found Purdue had evidence that pointed to illegal trafficking of its pills but in many cases did nothing to notify authorities or stop the flow. In response to the newspaper’s reporting, Purdue said in a statement that in 2007, it provided LA-area law enforcement information that helped lead to the convictions of the criminal prescribers and pharmacists referenced by the Los Angeles Times. The company also pointed to court documents that showed a wholesaler alerted the Drug Enforcement Administration about suspicious activity at a sham clinic noted in the newspaper’s story. Still, Everett contends Purdue created a market for addicts that didn’t exist until the company let its pills flood the streets. The region saw two spikes in overdose deaths: first from OxyContin and other opioid painkillers in 2008 and then, after the drug was reformulated in 2010, a spike from heroin as people switched to a potent but cheaper alternative, officials said. The city contends Purdue’s wrongful conduct fueled a heroin crisis in Everett. Between 2011 and 2013, nearly one in five heroin-related deaths in Washington state occurred in the Everett region. In response to the drug epidemic, Everett last year began sending social workers on routine patrols with police officers. Sgt. Mike Braley says the community outreach and enforcement team strikes a balance between enforcement and connecting people to addiction treatment, mental health and other services. “We understand that we can’t arrest our way out of problems that addiction is causing our city,” Braley said. Sometimes it takes many follow-ups and hours of handholding to get people help. On their first stop one morning, Braley and his team check under a street overpass, a popular hangout for addicts. They find plenty of needles, drug packaging and mounds of garbage but none of the people they had encountered there recently. They swing by a woody vacant piece of city property to follow up with a homeless man who told social workers he was on a housing list. He previously was reluctant to talk but opens up this time. Social worker Kaitlyn Dowd offers to check on the man’s housing status with a local nonprofit provider and then punches her number into a cellphone he recently got. “You can call me, and I have your number,” she tells him. Social worker Staci McCole said they come across many cases where highly functioning residents were introduced to opiates or heroin. “So many of these people -- somehow it’s taken a hold of them, and their lives now have forever changed,” she said.